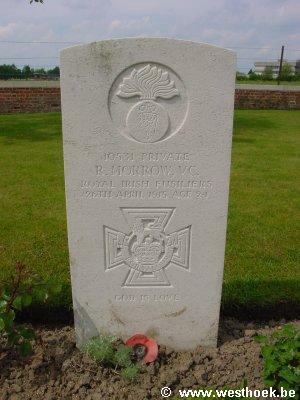 MORROW, Private, ROBERT, V C, 10531. 1st Bn. Royal Irish Fusiliers. 26th April 1915. Age 24. 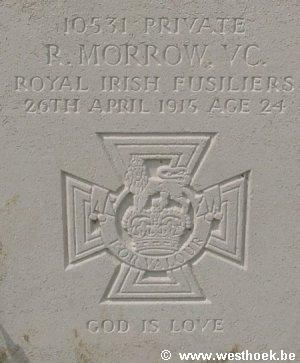 MORROW, Private, ROBERT, V C, 10531. 1st Bn. Royal Irish Fusiliers. 26th April 1915. Age 24. Son of Hugh and Margaret Jane Morrow, of Sessia, Newmills, Dungannon, Co. Tyrone. White House Cemetery IV. A. 44. An extract from "The London Gazette", No. 29170, dated 22nd May, 1915, records the following:-For most conspicuous bravery near Messines on 12th April, 1915, when he rescued and carried successively to places of comparative safety, several men who had been buried in the debris of trenches wrecked by shell fire. Private Morrow carried out this gallant work on his own initiative and under very heavy fire from the enemy.